QV 1d (Qld state on 1897 four numeral). QV 1d (Qld Widow Weeds 1900). 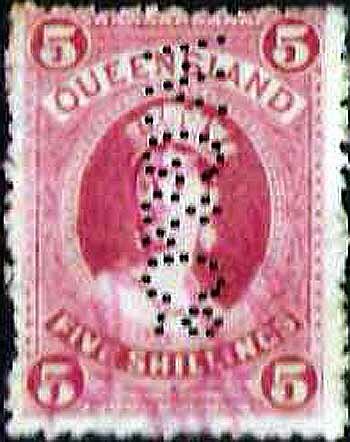 QV 1d (Qld state on 1897 four numeral) R4. QV 1d (Qld Widow Weeds 1900) R4. Background: Webster’s was formed by brothers William and his younger brother Alexander Webster. Both brothers were born in Scotland but William was the first to come to Queensland. At age 20 Alexander followed his brother travelling to Melbourne in 1866 on the ill fated "Netherby" which struck a reef off King Island in Bass Strait. On arrival in Melbourne Alexander went to the goldfields in Victoria and later to the rush in Gympie (Qld) before opening a store selling mining supplies. After his time on the goldfields he returned to England to be married but then returned to Brisbane (via Hobart) and joined William, who was by the early 1880’s a partner in the firm Webster, Watkin & Co. and trading in wines and spirits. Alexander obtained the agency from Alex Cowan & Co. paper merchants (Scotland) and the firm became known as Webster & Co.. They purchased premises in Mary Street in 1885 and they maintained contracts with the Queensland Government for paper and stationary. During the 1880’s the business expanded into general merchandise, shipping and insurance and this required new premises in, George Street, Stanley Street, West End and in Fortitude Valley as well as a wharf, all in addition to the factory in Mary Street. They also extended into regional areas with outlets in Kent Street, Maryborough; Quay Street, Rockhampton and Sturt Street, Townsville. William died around the turn of the century but Alexander took over until he died in 1923 aged 77. The company continued to trade until just before World War 2. Device: Queensland postal records show that the application for use of this device was sought and approved in July 1898. The strikes we have seen of the W&CO device indicate that it was a single head device. Other sources have reported usage from 1897 until as late as 1912 but this is not supported by the postmark evidence that we have seen. We have found usage from 1897 and such usage pre dating the application is not unknown, but the authors can find no usage later than 1899. This short usage period is consistent with the relative scarcity of the pattern on both postage and revenue stamps. Given the size of the user we would have expected that with a 15 year usage period the pattern would have been much more common. The device was almost certainly located at the Mary Street address in Brisbane rather than Webster’s other locations in Brisbane. We can find no evidence for use of the device in the Companies regional locations. QV (state issue on 1895, large chalon) 2/-, 2/6d, 5/-. QV (state issue on 2nd sideface) 1/-. QV (state issue on 1895, large chalon) 2/- R4, 2/6d R4, 5/- R4. 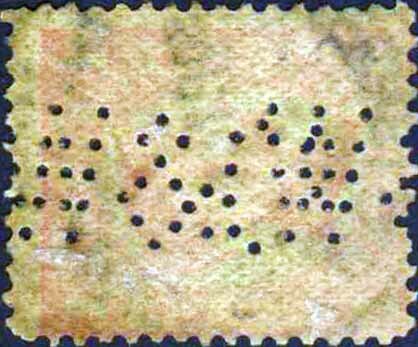 QV (state issue on 2nd sideface) 1/- R4. Background: William Gardiner and Co were warehousemen and they were headquartered in a substantial building in York Street, Sydney. The building had 8 floors with large internal lifts and two street frontages, and the company also held an adjoining property in Clarence Street. In addition they had a buying office in London and offices and representatives in Brisbane, Newcastle, West Maitland and the Pacific Islands. In December 1926 they amalgamated with fellow soft goods company, and perfin user, Sargood Brothers to form Sargoods Gardiner Pty. Ltd. The 71 York Street property was sold and the new company moved into a building that Sargoods had in construction at 24–26 York Street. Device: This device was located in their Brisbane office and was a single head device. William Gardiner and Co applied to the Post Office in NSW to use perforated stamps in 1888 but patterns from this the earliest of the W Gardiner devices are not seen until 1894. William Gardiner and Co used a range of small devices in there Sydney offices and warehouse and all of these are found on both postage and revenue stamps. These are dealt with in detail in the NSW section. Only this pattern WG&CO is also found used in Brisbane where it is found only on revenue stamps of Queensland. It is difficult to say with any certainty what happened with this device and how it came to be used on revenue stamps of both New South Wales and Queensland. Most likely the device moved from the Sydney office and was relocated up to Brisbane. We have noticed that the device was used between 1894 and about 1900 + (approx) in NSW. Late use in NSW shows some missing pins and it is notable that the strikes on Queensland stamps are much clearer. Also it seems that the set of fairly fine pins were replaced by slightly thicker pins at the same time that the device moved to Brisbane. The NSW WG/&/COLD.a and WG/&/COLD.b devices are found used from very early in the 20th Century about 1901 for WG/&/COLD.a and a few years later for WG/&/COLD.b. These may have been sourced as replacements for the WG&CO device when it moved to Brisbane. On the balance of probabilities the authors believe that the WG&CO device was moved from Sydney to Brisbane in the early1900's. The WG&CO pattern is found on postage and revenue stamps of NSW and then later on revenue stamps of Queensland.